By 1997, all 50 states and the District of Columbia had passed advance care planning statutes of some sort. Unfortunately, few laws and directives have kept pace with today's complex medical conditions and options for life prolonging and life extending measures. * Clearly explains the essential legal and medical concepts of Advance Care Planning. * Includes specific care instructions as well as defining the proxy's role as advocate. * Provides clear action steps to guide the proxy's decision making in any situation. * Is easy for the Declarant to complete and for proxies and physicians to honor. * Includes advanced dementia as a trigger for considering the use of or withholding of life prolonging and life extending measures. * Has instructions concerning nutrition and hydration apart from preferences for the use of or withholding of other life prolonging and life extending measures. * Respects patient autonomy and individual beliefs by permitting a Declarant to personalize the form with instructions about his or her unique wishes for end-of-life care. This Health Care Advance Directive may also be accepted in other states, insofar as it is consistent with those states' laws. However, if you believe this Iowa directive may be relied upon elsewhere in the future, consult legal counsel to verify its acceptance in specific jurisdictions outside Iowa. 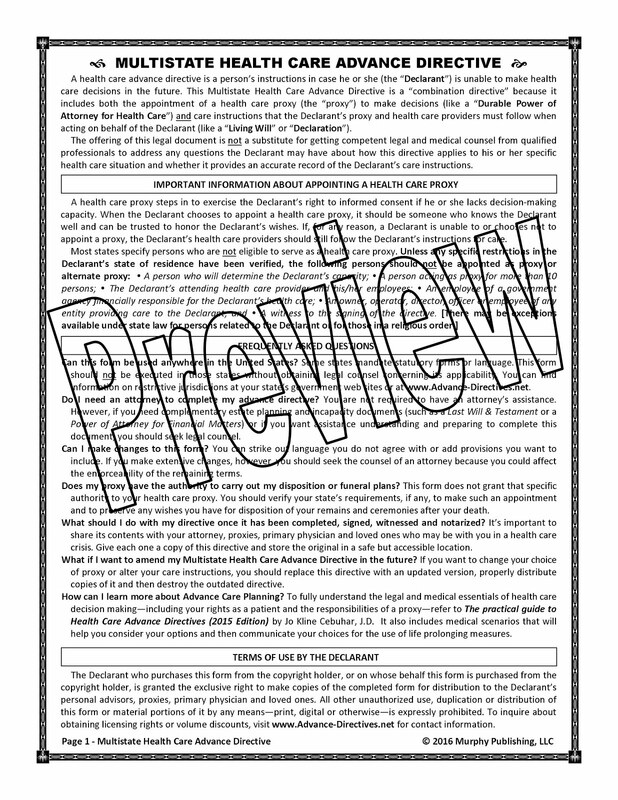 The offering of this legal document is not a substitute for getting competent legal and medical counsel from qualified professionals to address any questions the Declarant may have about how this directive applies to his or her specific health care situation and whether it provides an accurate record of the Declarant's care instructions. Why an Iowa Health Care Advance Directive form? What can I say--I was born here, educated here and live here. These are my peeps.